The permanent magnet rotor/impeller unit is driven by the magnetic field generated by the surrounding stator. The stator is wrapped entirely around the rotor. As a result, the entire pump is only slightly taller than the rotor itself, measuring only 1.5″ in height, perfect for applications where space is limited. 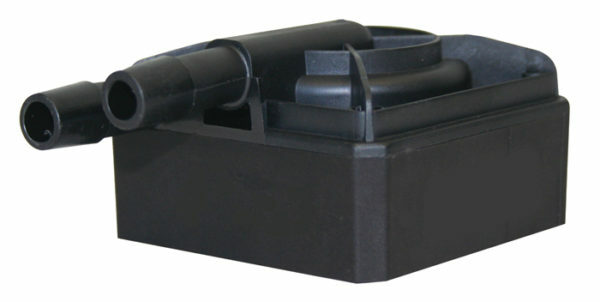 Invented by Laing, it is fundamentally different from conventional canned motor pumps. 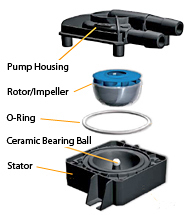 The only moving part in a spherical motor is a hemispherical rotor/impeller unit which sits on an ultra-hard, wear-resistant ceramic ball. There are no conventional shaft bearings or seals. This eliminates bearing noise and seal leaks.